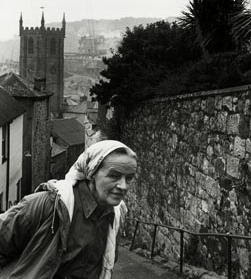 Anyone who visits St Ives often will be familiar with Barbara Hepworth's studio and garden, which is hidden away behind the busy high street. Tate St Ives runs the studio/garden and a small museum there. 'Finding Trewyn Studio was a sort of magic', wrote Barbara Hepworth; 'here was a studio, a yard and garden where I could work in open air and space'. 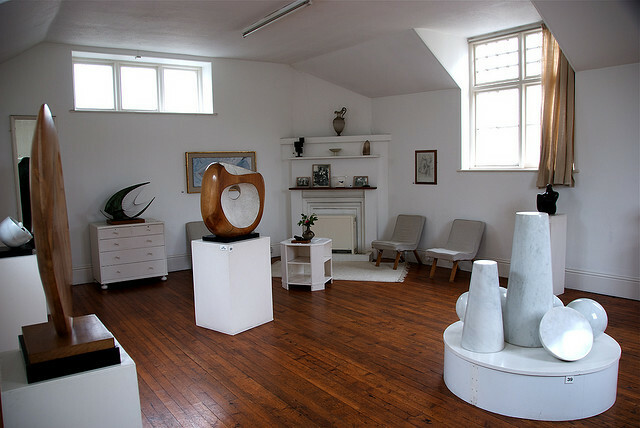 When she first arrived at Trewyn Studio, Hepworth was still largely preoccupied with stone and wood carving, but during the 1950s she increasingly made sculpture in bronze as well. This led her to create works on a more monumental scale, for which she used the garden as a viewing area. The bronzes now in the garden are seen in the environment for which they were created, and most are in the positions in which the artist herself placed them. The other story is about Barbara Hepworth. At the time Denis [Mitchell] and dad were her assistants. When journalists or photographers came round, she didn't want them to see that she had these people working away on her sculptures. So she would shut the workers in the greenhouse, where they had their morning breaks. Then Barbara would start polishing the sculpture, as if she'd been at it all day. One time my father was bursting for a pee, but she wouldn't let them out, and the only thing he could find was a pot with a geranium with very dry earth in it - but the pee went straight through and trickled across the greenhouse floor, and out under the door, between the legs of the visitors. Barbara banned him from having biscuits for the rest of the week. Which brings me back to what started me on this post - A great set of photos of details from Barbara Hepworth's studio on the indigoalison blog. By way of contrast you can see some more conventional views of the studio in Alice's Quaint Living blog. In fact the garden and studio must be one of the most photographed and blogged sites in the whole of Cornwall. Take a look at Mondoblogo for an excellent collection of old photographs of Barbara, her work and Trewyn Studio. Barbara Hepworth had a number of assistants who were later to go on and make their own artistic marks. Another of these was Breon O'Casey who died earlier this year (and who, incidentally, spent his early and middle years in Totnes and Torquay, Devon). 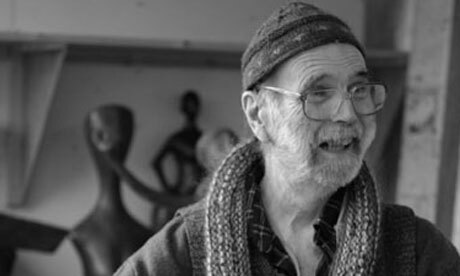 Through the popular sculptor Denis Mitchell, O'Casey met the sculptor Barbara Hepworth, in whose studio he worked for two days a week between 1959 and 1963. What he described as "a tough apprenticeship" in Hepworth's workshop proved to be his real artistic education. Hepworth could be challenging and a joke circulated about her assistants forming a workers’ fraternity whose club tie would be pierced by a hole. During O'Casey's time her old assistants moved on and she replaced them with new younger ones with fewer creative aspirations. O'Casey himself moved on and had to support his family with part-time work as a telephonist. 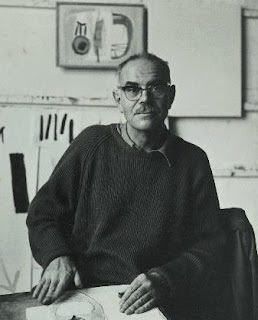 However, he demonstrated his versatility by producing his best work in a diverse range of media: Jewellery, weaving, etching, prints, engraving, painting and, latterly, sculpture. He also retained the respect of Hepworth, who acquired one of his paintings and commissioned him to make a gold cross for her. You can explore Barbara's garden and its sculptures further by using the Tate Kids' online tool - or you can read more in this short review by Rachel Wilson-Couch. If you are visiting St Ives you can often find work by Breon O'Casey and Terry Frost at Westcotts Gallery (now closed unfortuantely - see my previous post about the gallery).